As true as it gets...Smells just like spring in the garden of my childhood when the Lilacs were in full bloom! A cocktail of bright ginger, sparkling lime, orange and fresh apple. A customer favorite! An exotic blend of teakwood surrounded by rich spices of cardamom, cinnamon, and clove; sitting on base notes of cedar, amber, sandalwood, and patchouli. Extremely floral, and yet soft and powdery like a soft wind blowing through a garden of flowers, lingering in your nose for hours thereafter. Sweet, earthy and rich floral notes and light powdery incense make this a treat. Like a day at the ocean. A tropical beach breeze of sweet orange blossom, bright citrus, French lavender and powdery musk. The smell of ​crunchy granola blended with fresh oats, golden honey and vanilla bean. 8 oz. Shea & Aloe Cream, 4 oz. Sugar Scrub & 5 oz. bar soap. 8 oz. Cream, 4 oz. Sugar Scrub & Bar Soap. Not all Tattoo Conditioners/Lotions/Butters are created equal. Cruelty-free and 100% Vegan, our all-natural Tattoo Conditioner is also petroleum-, paraben-, phthalate- and gluten-free. Our conditioner is made from the finest fair-trade sourced ingredients including Organic African Shea, Cocoa and Mango Butters, Organic Hempseed, Grapeseed and Coconut Oils, Vitamin A, Vitamin B, Vitamin C, Vitamin D, Vitamin E, Vitamin F, Vitamin K and Trace Minerals. Our Tattoo Conditioner can be applied to the skin as needed (even on sensitive, acne- or eczema-prone skin). Most users continue to use the product long after their tattoo has healed to keep their skin moisturized and healthy, their colors vibrant and edges intact. 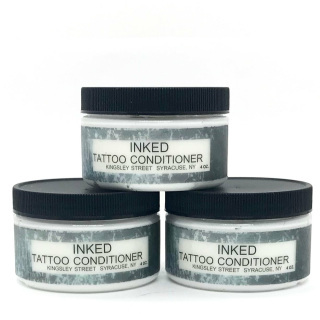 An unscented conditioner designed to help keep you tattoos sharp and vibrant. Price per one 4 oz. jar. Pink cettleya orchid and pear nectar blend with sensual sandalwood and soft amber. This lightly fragranced face cream is gentle enough for every day use and contains Sunflower Oil which is rich in Vitamin E that helps moisturize and regenerate skin. Quick absorbing and not greasy.